In the nematode, Caenorhabditis elegans, a conserved insulin-like signaling pathway controls larval development, stress resistance and adult lifespan. AGE-1, a homolog of the p110 catalytic subunit of phosphoinositide 3-kinases (PI3K) comprises the major known effector pathway downstream of the insulin receptor, DAF-2. Phospholipid products of AGE-1/PI3K activate AKT/PKB kinase signaling via PDK-1. AKT/PKB signaling antagonizes nuclear translocation of the DAF-16/FOXO transcription factor. Reduced AGE-1/PI3K signaling permits DAF-16 to direct dauer larval arrest and promote long lifespan in adult animals. In order to study the downstream effectors of AGE-1/PI3K signaling in C. elegans, we conducted a genetic screen for mutations that suppress the constitutive dauer arrest phenotype of age-1(mg109) animals. This report describes mutations recovered in a screen for suppressors of the constitutive dauer arrest (daf-C) phenotype of age-1(mg109). Two mutations corresponded to alleles of daf-16. Two mutations were gain-of-function alleles in the genes, akt-1 and pdk-1, encoding phosphoinositide-dependent serine/threonine kinases. A fifth mutation, mg227, located on chromosome X, did not correspond to any known dauer genes, suggesting that mg227 may represent a new component of the insulin pathway. Genetic epistasis analysis by RNAi showed that reproductive development in age-1(mg109);akt-1(mg247) animals was dependent on the presence of pdk-1. Similarly, reproductive development in age-1(mg109);pdk-1(mg261) animals was dependent on akt-1. However, reproductive development in age-1(mg109); mg227 animals required only akt-1, and pdk-1 activity was dispensable in this background. Interestingly, while mg227 suppressed dauer arrest in age-1(mg109) animals, it enhanced the long lifespan phenotype. In contrast, akt-1(mg247) and pdk-1(mg261) did not affect lifespan or stress resistance, while both daf-16 alleles fully suppressed these phenotypes. A screen for suppressors of PI3K mutant phenotypes identified activating mutations in two known pathway components, providing insights into their regulation. In particular, the interdependence of akt-1 and pdk-1, even in activated forms, supports the existence of AGE-1-independent pathways for these phospholipid-dependent kinases. Phenotypic analysis of these alleles shows that the larval and adult outputs of AGE-1/PI3K are fully separable in these mutants. In the nematode C. elegans, development, lifespan and stress resistance are regulated by a conserved insulin-like signaling pathway . Under optimal conditions, C. elegans nematodes develop through four larval stages (L1-L4) to become reproductive adults. In adverse environmental conditions, such as low food abundance or high population density, larvae can enter diapause and arrest development as dauer larvae. Dauer larvae are non-feeding, long-lived, sexually immature and stress resistant animals. Morphologically they are thinner and darker than reproductive adults [2, 3]. Once favorable conditions resume, dauer larvae can re-enter the reproductive developmental pathway to become fertile adults. In C. elegans, three genetic pathways influence the decision to arrest development at the dauer larval stage [3, 4]. One is a neuronal daf-11 guanyly lcyclase pathway [4, 5]. The second is a TGF-β pathway that regulates dauer arrest through expression of the DAF-7/TGF-β ligand . Ultimately, the daf-11 and daf-7 pathways act on a nuclear hormone receptor, encoded by daf-12 [4, 7]. The third pathway regulating dauer arrest is an insulin-like signaling pathway that includes the genes daf-2, encoding an insulin/IGF-I receptor-like protein, age-1, encoding the p110 catalytic subunit of PI3K, as well as a collection of protein kinases, encoded by the genes akt-1, -2, pdk-1 and sgk-1, which mediate phospholipid signaling downstream from AGE-1 [8–12]. Phosphoinositide bound PDK-1 activates the protein kinases which, in turn, phosphorylate and inhibit nuclear translocation of the FOXO transcription factor DAF-16 [13–16]. AGE-1/PI3K-generated phospholipids are believed to bind to both PDK-1 and AKT-1. Phosphoinositide bound AKT-1 undergoes a conformational change that promotes phosphorylation by PDK-1 and this phosphorylation is greatly enhanced if PDK-1 is also bound to phosphoinositides. However, kinase activity can also be detected in the absence of phosphoinositides suggesting that phospholipid-binding may not be absolutely required for PDK-1 catalytic activity [17, 18]. In addition to regulating dauer arrest in larvae, DAF-2/insulin signaling also regulates lifespan and stress resistance in adult animals [9, 19–23]. As with dauer larval arrest, daf-16 activity is required for the longevity and stress resistance phenotypes in daf-2 pathway mutants [20, 21]. DAF-2/insulin signaling regulates the expression of many genes involved in metabolism and stress resistance, including some genes that appear to be direct transcriptional targets of DAF-16, such as daf-15/RAPTOR and sod-3/Mn-SOD [24–26]. Most of the known daf-2 pathway components were identified in genetic screens on the basis of dauer arrest phenotype. In particular, a screen for suppressors of dauer larval arrest in animals with the null age-1(mg44) mutation uncovered hypermorphic alleles of akt-1 and pdk-1 [11, 12]. In order to determine whether additional effectors of AGE-1/PI3K signaling could be recovered by this approach, we repeated this screen, using the missense age-1(mg109) allele . Here, we describe five mutations identified in this screen, comprising two daf-16 alleles and new hypermorphic alleles of akt-1 and pdk-1 that appear to promote activation of AKT/PKB signaling in the absence of AGE-1/PI3K. The akt-1 and pdk-1 alleles also uncoupled the larval dauer arrest, adult longevity and stress resistance phenotypes of age-1(mg109) animals. We also describe an uncloned allele that has the unusual phenotype of enhancing the longevity of age-1(mg109) adult animals. These findings suggest that the larval and adult phenotypes of insulin signaling in C. elegans may be differentially affected by AKT/PKB signaling. In C. elegans, both lifespan and dauer formation are regulated by age-1 activity [10, 27]. Animals with maternal, but not zygotic, age-1 activity do not arrest as dauer larvae, but grow into reproductive adults that are stress resistant and long-lived. In the absence of both maternal and zygotic age-1 activity, animals arrest development as dauer larvae. In order to identify genetic modifiers of age-1, we conducted a screen for mutations that could suppress the dauer-constitutive (daf-C) phenotype of age-1(mg109), which carries a missense mutation in the lipid kinase domain of AGE-1/PI3K . Previously, a similar genetic screen identified the AKT-1 and PDK-1 effectors of AGE-1/PI3K [11, 12]. We repeated this screen in an effort to identify additional mutations capable of activating signaling in the absence of AGE-1/PI3K. From a screen of approximately 20,000 haploid genomes, we identified 40 alleles that could suppress the dauer-constitutive phenotype of age-1(mg109) animals (see Methods). Five of these alleles were chosen for further study, based on high penetrance and strong suppression of age-1(mg109) constitutive dauer arrest. In particular, four of these alleles, mg242, mg255, mg261 and mg227, strongly suppressed the age-1(mg109) dauer-constitutive phenotype (Table 1). The mg247 allele partially suppressed this larval phenotype, as age-1(mg109);mg247 animals bypassed dauer arrest but then developed into sterile adults (Table 1). Previous studies have shown that adult sterility is correlated with modest decrements in AGE-1/PI3K signaling [27, 28]. In addition to the adult sterility phenotype, mg247 animals also exhibited a slight developmental delay, which has also been previously observed in insulin pathway mutants [19, 27, 28]. Thus, we conclude that the mg247 allele only partially restores phospholipid signaling in age-1(mg109) animals. Suppression of the age-1(mg109) dauer arrest phenotype. Some animals exhibited Egl (egg retention) phenotype: * 35 %, ** 4.7 %, *** 32 %, # 100 %. § These are homozygote progeny of age-1(mg109) homozygous hermaphrodites that have been maternally rescued for dauer arrest . Using standard SNP snip-mapping protocols, we mapped four of these alleles to genetic regions that contained known components of the age-1 pathway . Molecular lesions in candidate genes were identified by direct DNA sequencing (see Methods). 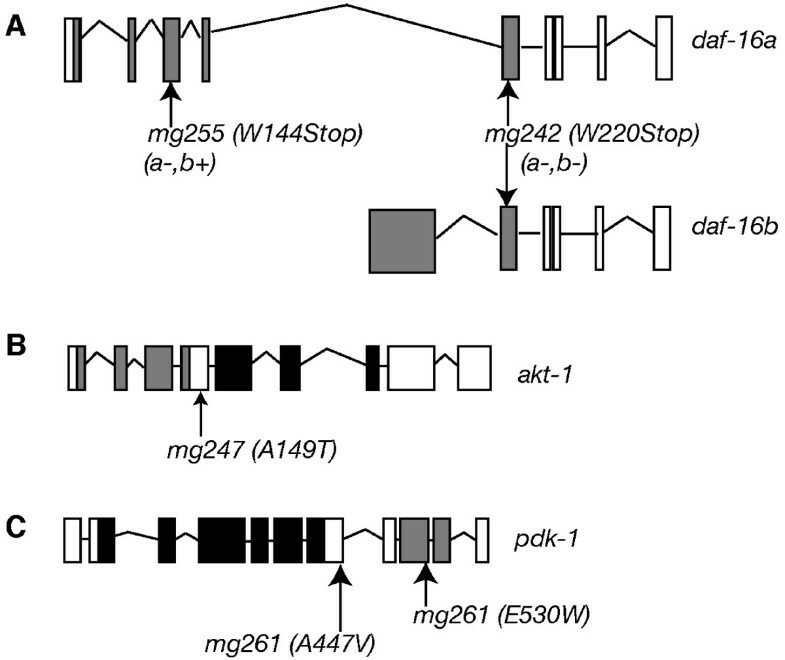 Two alleles, mg242 and mg255, corresponded to nonsense mutations in daf-16 (Figure 1A). daf-16(mg242) is a Trp220Amb nonsense mutation in the forkhead DNA binding domain of DAF-16 and truncates both major daf-16 splice forms, daf-16a and daf-16b, resulting in a predicted null phenotype. daf-16(mg255) carries a Trp144Amb nonsense mutation in the forkhead domain of the daf-16a splice form only (Figure 1A). Two other suppressor alleles corresponded to mutations in the serine/threonine kinases that are regulated by phosphoinositide (PIP) products of AGE-1/PI3K. The mg247 allele corresponded to a missense mutation in akt-1 (Ala149Thr). This mutation changes a nonconserved residue in the linker region between the pleckstrin homology (PH) and kinase domains of AKT-1 and is predicted to affect both akt-1a and akt-1b splice forms (Figure 1B). The mg261 allele is the result of two mutations in different regions of PDK-1 of which both are missense mutations. The first corresponds to a nonconserved residue in the linker region between the kinase domain and the PH domain (Ala447Val) and the second in a conserved residue in the PH domain (Glu530Trp) (Figure 1C). A fifth mutation, mg227, was mapped to a region of chromosome X that does not contain any known components of the daf-2 pathway. Two known dauer pathway genes, sgk-1 (X 23.70) and daf-12 (X 2.39), are also on chromosome X but are on the outside of the candidate region and thus do not correspond to the gene mutated by mg227 (see Methods) [7, 8]. Mutations identified as suppressors of constitutive dauer arrest in age-1(mg109) animals. Suppressors were mapped using standard SNP-snip-mapping protocols with the Hawaiian strain CB4856 . Mutations were confirmed using PCR and direct DNA sequencing. (A) daf-16(mg242) is a Trp220Amber substitution in exon 5, affecting both daf-16a and daf-16b splice forms. daf-16(mg255) is a Trp144Amber substitution in exon 3 that only affects the daf-16a splice form. Both mutations fall within the Forkhead domain (indicated by the grey area) involved in DNA interaction. (B) akt-1(mg247) is an Ala149Thr substitution that falls in the linker region, between the pleckstrin homology domain (PH, indicated by the grey boxes) and the protein kinase C domain (KD, indicated by the black boxes). (C) pdk-1(mg261) is a Ala447Val substitution in the linker region and a Glu530Trp substitution in the pleckstrin homology domain (PH, grey boxes) of PDK-1. Both akt-1 and pdk-1 encode proteins that are effectors of signaling downstream of AGE-1/PI3K [11, 12]. The observation that the akt-1(mg247) and pdk-1(mg261) alleles suppressed the daf-C phenotype of age-1(mg109) animals suggested these alleles may activate AKT-1 and PDK-1 function in the absence of the phospholipid products of AGE-1 (Table 1). Consistent with this hypothesis, both akt-1(mg247) and pdk-1(mg261) segregate in a dominant fashion (progeny of heterozygous mothers were scored, akt-1(mg247), 72.2 % bypassers, 27.8 % dauers, n = 467 animals: pdk-1(mg261), 75.8 % bypassers, 24 % dauers, n = 153 animals). To confirm that mg247 and mg261 were activating mutations, we tested whether RNA interference (RNAi)-mediated expression of these genes could revert their suppression of age-1(mg109) dauer arrest. Since age-1(mg109);akt-1(mg247) adults were mostly sterile at 25°C, we conducted these experiments at 20°C using the feeding RNAi protocol . Consistent with mg247 being a hypermorphic akt-1 allele, RNAi of akt-1 in age-1(mg109);akt-1(mg247) animals fully reversed the suppression of dauer arrest and animals arrested as dauer larvae (Figure 2). Similarly, pdk-1 RNAi reversed the dauer suppression phenotype in age-1(mg109);pdk-1(mg261) animals. We next examined the epistatic relationships of akt-1(mg247) and pdk-1(mg261) with other components of the AGE-1/PI3K effector pathway using RNAi. First, we found that pdk-1(RNAi) caused constitutive dauer larval arrest in age-1(mg109);akt-1(mg247) animals, suggesting that mg247-activated AKT-1 required PDK-1-mediated phosphorylation for activity (Figure 3). In contrast, akt-2(RNAi) did not have a significant effect on the development of age-1(mg109);akt-1(mg247) animals. PDK-1 is believed to be constitutively active under basal conditions [17, 18]. Thus, in age-1(mg109) animals carrying the akt-1(mg247) allele, PDK-1 may be active at low levels. 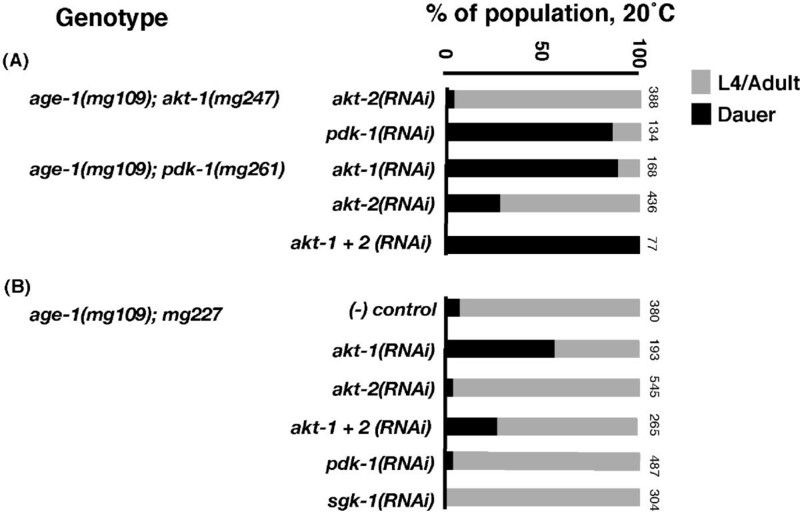 RNAi epistasis analysis of age-1(mg109) suppressors reveals interdependence of AKT-1 and PDK-1. To establish whether akt-1(mg247), pdk-1(mg261) and mg227 mutations suppressed dauer arrest through the AGE-1/PI3 kinase pathway we carried out a series of genetic epistasis experiments using RNAi. Bars show the percentage of animals that bypassed dauer arrest, developing into L4 larvae or adults (grey), and those that arrested as dauers (black). Numbers on the side of the bars represent the total number of animals examined. RNAi experiments were diluted with control L4440 RNAi to match the mixed akt-1 and akt-2 RNAi dose. (A) age-1(mg109);akt-1(mg247) animals arrested as dauer larvae on pdk-1 RNAi. Similarly, age-1(mg109);pdk-1(mg261) animals arrested as dauer larvae on akt RNAi. (B) Epistasis analysis on age-1(mg109);mg227 animals suggests mg227 requires akt-1 but not akt-2, sgk-1 or pdk-1 to bypass dauer larval arrest. Next, we observed that reproductive development of age-1(mg109);pdk-1(mg261) animals was suppressed by akt-1(RNAi), and this effect was enhanced in combination with akt-2(RNAi), showing that the activated form of PDK-1 remained coupled to the AKT/PKB outputs (Figure 3). Bypass of dauer larval arrest in age-1(mg109);akt-1(mg247) and age-1(mg109); pdk-1(mg261) animals was unaffected by RNAi-mediated knockdown of sgk-1, which encodes another effector of AGE-1/PI3K signaling (data not shown) . 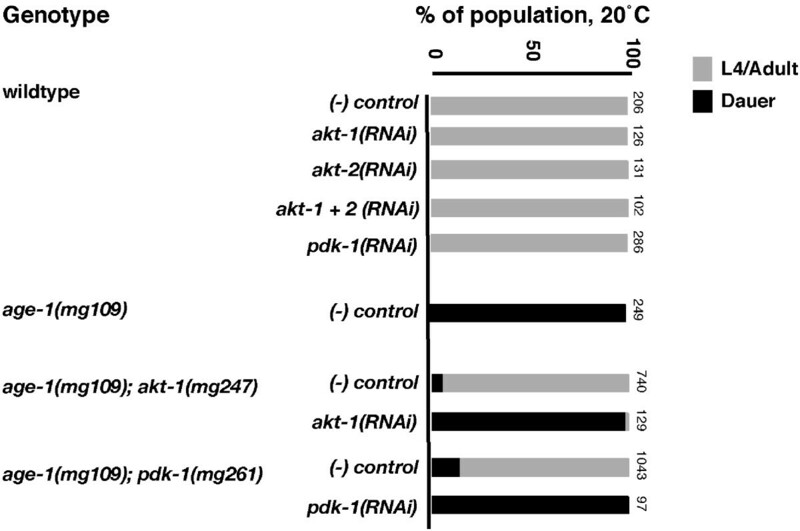 We also analyzed the epistatic interactions of mg227 with akt-1, akt-2, sgk-1 and pdk-1. In these experiments, akt-1(RNAi) partially suppressed bypass of dauer larval arrest in age-1(mg109); mg227 animals, indicating that mg227 may act upstream of akt-1. However, development in age-1(mg109);mg227 animals was not affected by akt-2, sgk-1 or pdk-1 RNAi (Figure 3). Although all 5 of these alleles could suppress dauer arrest in age-1(mg109) animals, there were significant differences in their effects on the age-1(mg109) adult longevity and stress resistance phenotypes. Only the daf-16 alleles, mg242 and mg255, fully suppressed age-1(mg109) adult longevity (Log-Rank test, P ≤ 0.0001 vs. age-1(mg109), Table 2; Figure 4A). In addition, age-1(mg109) animals carrying either the mg242 or mg255 alleles also lived significantly shorter than wildtype animals, consistent with previous reports of shortened lifespan by daf-16 mutations [16, 31]. The daf-16(mg242) allele, which disrupts both the daf-16a and daf-16b isoforms, caused a slightly greater lifespan reduction in age-1(mg109) animals, than the daf-16a-specific mg255 allele (Log-Rank test P ≤ 0.0001 mg242 vs. mg255). However, this difference was minor, indicating that the daf-16a isoform provides the majority of the DAF-16 function required for longevity in age-1(mg109) animals. Adult lifespan of age-1(mg109) dauer arrest suppressors. b These are homozygote progeny of age-1(mg109) homozygous hermaphrodites that have been maternally rescued for dauer arrest . d Wilcoxan P value = 0.2370.
f Lifespan assays performed at 20°C. n indicates the number of animals scored in at least three independent trials. Lifespan is differentially affected by age-1(mg109) dauer arrest suppressors. Adult lifespan of wildtype, age-1(mg109) and suppressor mutations in the age-1(mg109) background, as indicated. age-1(mg109) animals were maternally rescued (mg109/mg109) progeny of mg109/+ hermaphrodites. (A) Both daf-16 alleles, mg242 and mg255, suppressed age-1(mg109) adult longevity. The mg242 allele, which affects both daf-16 splice forms, had a slightly stronger effect on age-1(mg109) longevity than the daf-16a-specific mg255 allele (P < 0.001, mg242 vs.mg255). (B) The akt-1 (mg247) and the pdk-1 (mg261) alleles did not significantly affect age-1(mg109) adult longevity. The mg227 allele enhanced age-1(mg109) adult longevity. Adult lifespan data is shown in Table 2. Neither akt-1(mg247) nor pdk-1(mg261) suppressed age-1(mg109) adult longevity (Table 2; Figure 4B). Interestingly, the mg227 allele enhanced longevity of age-1(mg109) adults (Log-Rank test P = < 0.0001 vs.age-1(mg109), Table 2; Figure 4B) and this enhancement was daf-16 dependant (Table 2). Reductions in AGE-1/PI3K signaling are associated with increased resistance to oxidative and thermal stresses [22, 23]. We therefore examined the effects of dauer arrest suppressors on survival of age-1(mg109) animals under conditions of oxidative and thermal stress. Both daf-16 alleles, mg242 and mg255, completely suppressed oxidative stress resistance of age-1(mg109) animals tested by treatment with 10 mM paraquat, an intracellular free radical generator (Figure 5a). However, neither akt-1(mg247), pdk-1(mg261) or mg227 suppressed oxidative stress resistance of age-1(mg109) animals to paraquat. Double mutant age-1(mg109) animals carrying any of these suppressor alleles appeared to have increased survival in the presence of 10 mM paraquat, compared to parental age-1(mg109) animals (Figure 5a. Similar results were observed for suppression of thermotolerance of age-1(mg109) adults, as tested by survival at the stressful temperature of 35°C (Figure 5b). The age-1(mg109) stress resistance phenotype is differentially altered by dauer arrest suppressors. (A) Oxidative stress was assessed by treatment with 10 mM paraquat on normal agar medium from the first day of adulthood. age-1(mg109) animals were more resistant to oxidative stress when compared to wildtype animals. Both daf-16 alleles suppressed the age-1(mg109) stress resistant phenotype. Neither akt-1(mg247), pdk-1(mg261) or mg227 suppressed oxidative stress resistance of age-1(mg109). *P < 0.0001, vs. age-1(mg109). Mean survival ± SE, age-1(+), 2.76 ± 0.07 days (n = 96); age-1(mg109), 5.14 ± 0.10 days, (n = 107); daf-16(mg255);age-1(mg109), 4.02 ± 0.09 days, (n = 112); daf-16(mg242);age-1(mg109),3.22 ± 0.05 days, (n = 122); age-1(mg109);akt-1(mg247), 8.6 ± 0.18 days, (n = 112);age-1(mg109);pdk-1(mg261), 5.96 ± 0.32 days, (n = 63);age-1(mg109);mg227, 7.48 ± 0.27 days, (n = 87). (B) Synchronized animal populations were subjected to heat stress at 35°C for 16 hours and scored for survival. Shown is fraction alive in 3 experiments with 60 – 100 animals/experiment; error bars, SEM, #P < 0.05. age-1(mg109) animals were more resistant to heat stress when compared to wildtype animals and both daf-16 alleles suppressed the age-1(mg109) stress resistant phenotype. However, neither akt-1(mg247), pdk-1(mg261) or mg227 suppressed the stress resistance of age-1(mg109). Mean fraction alive ± SD, age-1(+), 0.14 ± 0.14; age-1(mg109), 0.61 ± 0.20; daf-16(mg255);age-1(mg109), 0.39 ± 0.29; daf-16(mg242);age-1(mg109), 0.35 ± 0.43; age-1(mg109);akt-1(mg247), 0.93 ± 0.08; age-1(mg109); pdk-1(mg261), 0.87 ± 0.08; age-1(mg109);mg227, 0.66 ± 0.5. We also analyzed the intestinal response to fasting in these strains by monitoring the FIRE response (Fasting-Induced Redistribution of Esterase activity) . After a 6-hour fast, intestinal esterase activity in wildtype adults redistributes from cytoplasmic to nuclear localization (Figure 6A, B). This response is altered in age-1(mg109) adults, which continue to exhibit the cytoplasmic pattern of esterase activity after a 6-hour fast (Figure 6C). Both the daf-16(mg242) and daf-16(mg255) mutations suppressed the altered FIRE response in age-1(mg109) animals, while akt-1(mg247), pdk-1(mg261) and mg227 had no effect on the altered FIRE response of age-1(mg109) animals (Figure 6D–H). Suppression of altered FIRE response in age-1(mg109) animals. Distribution of intestinal esterase activity in (A) well-fed or (B) fasted age-1(+) young adult animals exhibited the fasting-induced redistribution (arrows) of esterase from the intestinal cytoplasm (A) to a nuclear pattern (B). (C) age-1(mg109) adults were resistant to the FIRE response. Altered FIRE response of age-1(mg109) animals was suppressed by (D) daf-16(mg242) and (E) daf-16(mg255) alleles, but not by (F) akt-1(mg247), (G) pdk-1(mg261) or (H) mg227 mutations. Scale bars, 50 μm. Finally, we investigated the effects of these mutations on DAF-16:GFP localization. In wildtype animals, 35°C heat stress could induce the nuclear localization DAF-16:GFP translational fusion (Figure 7A, B). In unstressed wildtype animals DAF-16:GFP was detected in both the nucleus and cytoplasm. Defects in the insulin signaling pathway should cause nuclear accumulation of DAF-16:GFP as previously reported [13–15]. We observed that DAF-16:GFP fluorescence was predominantly nuclear in age-1(mg109) adults containing the daf-16(mg255) mutation (Figure 7C). In contrast, DAF-16:GFP showed both nuclear and some cytoplasmic localization in age-1(mg109) animals carrying the akt-1(mg247), pdk-1(mg261) or mg227 alleles (Figure 7D–F). Thus we conclude that the mutations activating AKT signaling may partially rescue DAF-16:GFP nuclear localization by the age-1(mg109) allele. age-1(mg109) suppressor mutants differentially redistributes DAF-16:GFP localization. Intestinal DAF-16:GFP localization redistributed to the nucleus of wildtype animals after a period of heat stress (35°C) (A, B). DAF-16:GFP localization is primarily in the nucleus of daf-16(mg255);age-1(mg109) animals (C) reflecting localization of DAF-16 in a age-1(mg109) animal. In contrast, DAF-16:GFP localization was seen in both the cytoplasm and nucleus of age-1(mg109);akt-1(mg247) animals (D), age-1(mg109);pdk-1(mg261) animals (E) and age-1(mg109);mg227 (F). Scale bar 50 μm. In C. elegans, signaling by the DAF-2/insulin receptor, via AGE-1/PI3K, regulates developmental arrest at the dauer larval stage, as well as longevity and stress resistance in adult animals. Here, we report the characterization of new mutations identified through a genetic screen designed to identify components of the AGE-1/PI3K signaling pathway. This screen identified 2 mutations inactivating one or two isoforms of daf-16, which encodes the FOXO transcription factor that is the ultimate output of AGE-1/PI3K signaling. Both of the daf-16 alleles suppressed all the age-1(mg109) dauer and adult phenotypes examined, consistent with the conclusion that daf-16 activity is necessary for both the larval and adult phenotypes of age-1 mutant animals. Additionally, we identified 3 mutations that uncoupled the larval and adult phenotypes of AGE-1/PI3K signaling. These mutations appear to activate the AKT/PKB effector pathway of AGE-1/PI3K signaling, as evidenced by the dependence of these 3 alleles on wildtype akt-1 and/or pdk-1 activity. Previous reports also identified activating mutations in akt-1 and pdk-1, yet ours is the first report to probe in depth the effects of this class of mutations on adult AGE-1/PI3K functions [11, 12]. In addition, we report the phenotypic characterization of a new mutation, mg227, which has the unusual phenotype of enhancing adult longevity in age-1(mg109) animals in addition to suppressing larval dauer arrest. We also identified an activating allele of pdk-1, encoding the kinase that phosphorylates and activates phospholipid-bound AKT/PKB. The mg261 mutant contains mutations of both a nonconserved residue in the linker region and a conserved residue in the PH domain which may mediate binding to the phospholipid products of AGE-1/PI3K [34, 35]. A previously identified activated pdk-1 allele, mg142, corresponded to an Ala303Val substitution in the PDK-1 kinase domain and was shown to increase the basal level of PDK-1 kinase activity . The regulation of PDK-1 signaling is complex and depends on the downstream target in question . 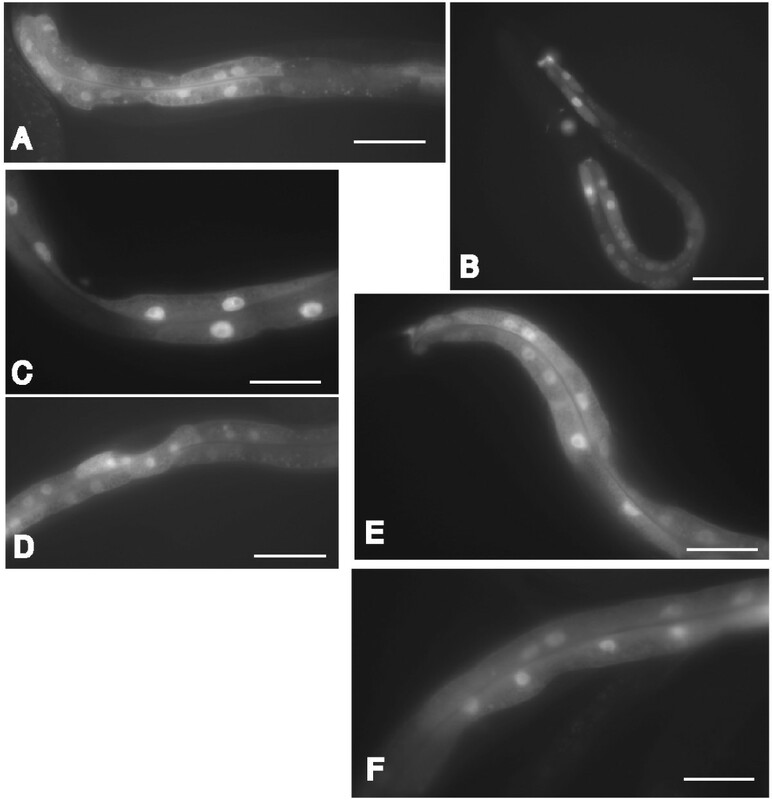 In C. elegans, the major targets of PDK-1 are believed to be AKT-1, -2 and SGK-1 [8, 11, 12]. One possibility is that the mg261 mutation in the PH domain could alter the specificity of PDK-1 phospholipid binding, enhancing PDK-1 activity in the absence of AGE-1/PI3K phospholipid products. However, PDK-1 is active in age-1(mg109) as evidenced by age-1(mg109);akt-1(mg247) mutants. Therefore it is not entirely clear how the pdk-1(mg261) allele is activating AKT-1. daf-16 activity is required for both the larval dauer arrest and adult longevity and stress resistance phenotypes that result from genetic deficiencies in the age-1 pathway [21, 27]. Consistent with previous findings, the daf-16 alleles described here suppressed both larval and adult phenotypes of age-1(mg109) animals. In contrast, the akt-1(mg247), pdk-1(mg261) and mg227 alleles did not affect the age-1(mg109) adult phenotypes. Thus, the larval and adult outputs of AGE-1/PI3K signaling are differentially affected by akt-1(mg247), pdk-1(mg261) and mg227 alleles. It was previously shown that pdk-1 activity is necessary for wildtype adult lifespan, demonstrating that PDK-1 mediates the adult outputs of AGE-1/PI3K signaling . Thus, we propose that the differential suppression by pdk-1(mg261) of the age-1(mg109) larval versus adult phenotypes results from insufficient activation of PDK-1 activity for adult, but not larval, phenotypes. A similar explanation may account for the inability of akt-1(mg247) to suppress adult phenotypes of age-1(mg109) animals. However, a previous report suggested that SGK-1, and not AKT-1 or -2, may be the primary mediator of DAF-2 and AGE-1 signaling in adult animals . Thus, it is possible that akt-1 itself does not affect adult-specific functions, but only the dauer-specific functions of insulin signaling. However, we have observed that the DAF-16::GFP reporter is distributed in the cytoplasm in adult age-1(mg109); akt-1(mg247) animals, suggesting that mg247 at least partially restores wildtype regulation of DAF-16 in adult animals. Thus, there may be additional pathways that converge with AGE-1/PI3K signaling to regulate DAF-16 activity and, ultimately, lifespan in adult animals. One possible explanation for the different effects of these mutations on the larval versus adult phenotypes of age-1(mg109) animals is that they partially restore insulin pathway signaling and negative regulation of DAF-16. According to this model, wildtype levels of insulin pathway signaling may strongly inhibit DAF-16 and promote reproductive development and adult lifespan. Whereas, low insulin signaling promotes both dauer larval arrest and adult longevity [19–21]. The mutations activating AKT signaling appear to promote intermediate levels of insulin pathway signaling, allowing reproductive development, but prolonging adult lifespan. This phenotypic gradient could reflect a gradient of DAF-16 activity in these strains, in which the highest levels of DAF-16 activity causes dauer larval arrest (Figure 8). 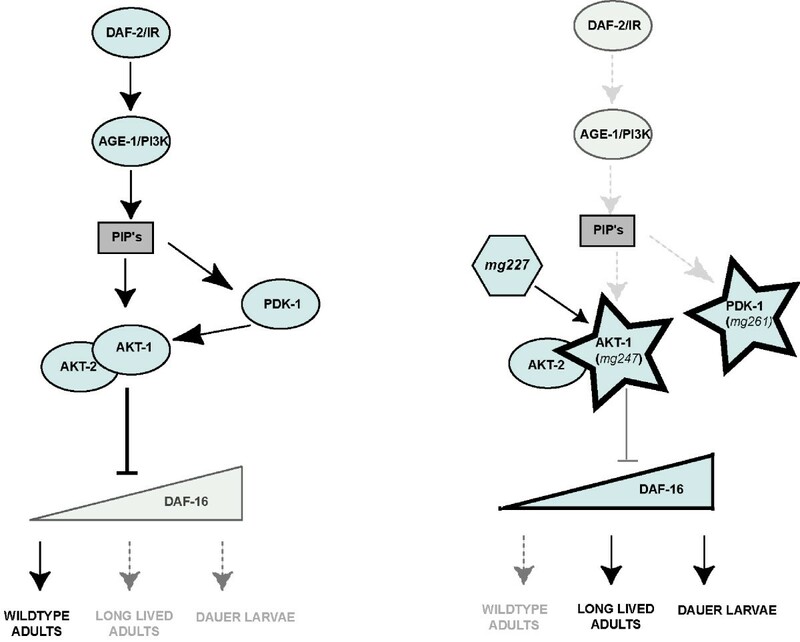 Thus the mutations activating AKT signaling may allow an intermediate level of DAF-16 activity, which is insufficient to promote dauer larval arrest, but does promote adult longevity. This is similar to a DAF-16 gradient model that has been previously proposed . Model for regulation of insulin pathway phenotypes by AKT-1 and PDK-1 activation. Activated signaling components in the absence of AKT-1 signaling in age-1(mg109) mutant background. See text for details. In this study we identified mutations capable of activating signaling in the absence of AGE-1/PI3K. We describe five mutations including two mutations inactivating one or two isoforms daf-16 and two new hypermorphic alleles of akt-1 and pdk-1. The daf-16 alleles described in this work suppress age-1(mg109) dauer and adult phenotypes examined consistent with previous reports. The akt-1 and pdk-1 alleles uncouple the dauer arrest, adult longevity and stress resistance phenotypes of age-1(mg109) mutants. Furthermore, genetic epistasis analysis suggests these hypermorphic alleles are interdependent. These findings suggest larval and adult phenotypes of insulin signaling are fully separable in these mutants. 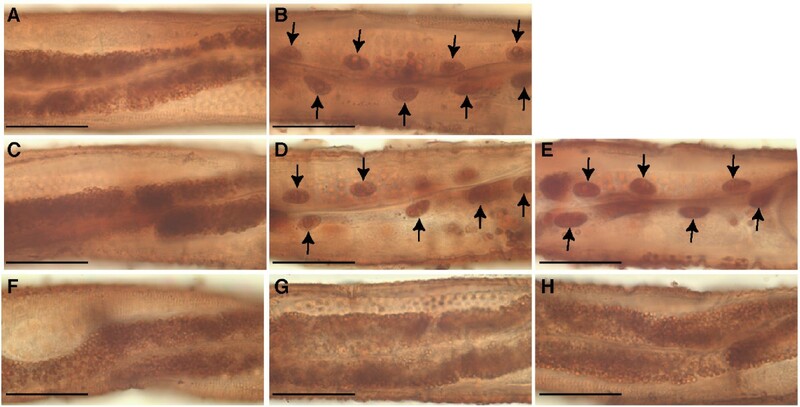 The C. elegans strains used in this work were N2 Bristol (wildtype), sqt-1(sc13) age-1(mg109)/mnC1; and CB4856 Hawaiian. Strains were provided by the Caenorhabditis Genetics Center at the University of Minnesota. All strains were cultivated at 15°C on NGM agar plates seeded with the E. coli strain OP50 following standard protocols . Suppressors were isolated as previously described on a parent strain carrying the sqt-1(sc13) age-1(mg109) mutation balanced with mnC1 and F2 progeny were screened for suppression of the age-1(mg109) constitutive dauer arrest phenotype . From a screen of 20,000 haploid genomes, 40 suppressors were identified of which 5 were crossed with Hawaiian strain males (CB4856). DNA from these suppressor recombinants were collected and analyzed using SNP-snip mapping for each chromosome . For candidate gene sequencing, genomic DNA from the mutant strains (sqt-1(sc13) age-1(mg109); m/m) was PCR amplified with exon-specific primers and sequenced to identify molecular changes. mg227 SNP-snip mapping showed strong linkage to the right arm of chromosome X between 10.5 – 13.5 m. u. Candidate genes were PCR amplified and sequenced. Genes sequenced included known dauer forming genes, daf-12, (F11A1.3, X2.39), lin-14 (T25C12.1, X4.28), bra-1 (F54B11.6, X13.84), akt-2 (F28H6.1, X16.56) and sgk-1 (W10G6.2, X2.70). Furthermore, a cosmid carrying the daf-12 gene did not rescue the mg227 daf-C suppression phenotype in age-1(mg109);mg227 animals (5 trangenic lines examined, 94 % of animals bypassed dauer arrest, 6 % arrested as dead eggs). A 500 bp region spanning the largest exon in both akt-2 and pdk-1 was amplified from N2 DNA and cloned into the RNAi feeding vector L4440 . akt-1 (RNAi) and daf-16 (RNAi) was obtained from the RNAi feeding library . LB broth supplemented with 100 μg/mL of ampicillin was inoculated with RNAi clones and grown overnight at 37°C without shaking. RNAi experiments were typically carried out on 6-well plate NGM media supplemented with 50 μg/mL ampicillin and 1 mM IPTG. Overnight bacterial cultures were seeded on duplicate wells and allowed to grow at room temperature for a further 12 – 16 hr. G1 and G2 progeny of fertile hermaphrodites were collected in a 5-hour egg lay on RNAi bacteria. The G2 progeny were allowed to grow at 20°C for 3 days after which any phenotypes were scored. Plates were re-examined 24 hr later for changes in phenotypes if any. Each experiment was done in triplicate. To assay dauer larval arrest, gravid adult hermaphrodites were allowed to lay eggs at room temperature for 4 hours to produce a synchronized population. Animals were then shifted to 25°C or 20°C and left to develop for a further 72 or 96 hours after which the number of dauers and adults (sterile or fertile) was counted. Sterility was scored as the absence of embryos in the uterus in young adults (day 1–2). For lifespan analysis, larvae were raised at 15°C until the first day of adulthood (Day 0) prior to being shifted to 25°C on standard NGM plates supplemented with FUDR (50 μg/mL). Survival analyses were always performed in the presence of FUDR, since some of these strains have an egg-laying defect that causes eggs to accumulate within the uterus and hatch, thereupon killing the parent hermaphrodite. FUDR treatment helps to remedy this problem as it is an inhibitor of DNA synthesis and prevents embryonic development. Animals were scored every two days for death by failure to respond to gentle prodding on the head and tail. All aging experiments were repeated in at least three separate trials and cumulative results were analyzed. Lifespan statistical analysis was performed using the JMP software package (version 5.1). For paraquat and thermotolerance survival, young adults were obtained as for lifespan assays. For paraquat treatments, day 0 adults were shifted to standard NGM plates supplemented with 10 mM paraquat at 20°C. Survival of animals was scored at 2 or 3 day intervals by failure to respond to gentle prodding. For thermotolerance assays, synchronized young gravid adults were placed on bacteria-free NGM plates pre-heated to 35°C. All plates were wrapped in Parafilm to prevent dessication and placed in a 35°C incubator for 16 hours. Survival was scored by failure to respond to gentle prodding after 16 hours. FIRE response was assayed by scoring cytoplasmic versus nuclear intestinal esterase activity, as described previously . Briefly, stress due to food deprivation was achieved by transferring bacteria-free young adult animals to NGM agar with 100 μg/mL ampicillin and incubating at 25°C for 6 hours. Fasted adults were fixed with methanol (-20°C) for 10 minutes and incubated overnight at room temperature in staining solution described previously . Stained specimens were mounted on 2 % agarose pads and viewed on a Nikon E800 microscope with Nomarski optics. Images were collected using a Hamamatsu ORCA-ER CCD camera using OpenLab software (Improvision, Lexington, MA). A gfpdaf-16 cDNA fusion was constructed using an intestinal gly-19 promoter as previously described . In brief, the DAF-16:GFP plasmid was constructed by inserting a gfp coding sequence in-frame with the daf-16a full-length cDNA. The intestinal promoter was cloned upstream of gfpdaf-16 using unique SphI and KpnI sites. Plasmid were injected into adult hermaphrodites at a final concentration of 25–100 μg/mL . We thank members of the NIA Intramural Research Program and the Baltimore/Washington C. elegans research community for helpful discussions. We also thank Suzanne Paradis and Gary Ruvkun for resources, help and guidance in performing the age-1(mg109) suppressor screen. The C. elegans Genetics Center and the Ruvkun lab provided strains used in this work. This work was supported by the National Institute on Aging Intramural Research Program and by a New Scholar in Aging Award from the Ellison Medical Foundation (C.A.W.). MSG carried out genetic mapping of daf-16(mg242), daf-16(mg255), akt-1(mg247) and mg227, lifespan analysis, RNAi experiments, oxidative stress and heat stress assays on all mutations, and wrote the manuscript. WBI performed the FIRE assays and DAF-16:GFP localization analysis. KH carried out mapping of pdk-1(mg261). CAW carried out the genetic screen as a postdoctoral fellow in Gary Ruvkun's laboratory and wrote the manuscript.